A few weeks ago we talked about the City Council’s “Targeted Improvements” (or “Quick Wins”) programme that is being rolled out. One of the tools that fits in very well with this programme is cycle lane separators, as previously trialled in a couple of places in Christchurch. Now the Council would like some feedback on where some more could go in. These seem to work well – so where should we put some more? Following on from the successful trials at two locations, the City Council are keen to identify further locations where problems exist that the separators could improve. From this they want to create a list of candidate sites that will then be assessed for prioritising and implementation. A combination of low “Riley kerb” and high “flexi-post” delineators was previously trialled but, for now, the intention is to just use the flexi-posts. At some locations, sandblasting and re-marking of cycle lanes will also be needed to achieve desirable widths (the posts do have the effect of narrowing the perceived available cycling width). Current funding this financial year might only achieve about 10 intersections (say, two approaches to each) and maybe another 12 curved cycle lane sites. The amount of funding for these in the 2014/15 year will be reviewed later. It’s important to appreciate that these separators won’t necessarily be the best option for every location. Complications like parking and driveways for example may make some locations tricky. Ultimately on the Major Cycleway Routes we may be looking for a higher standard of cycleway to attract new riders, e.g. using more physical separation. Flexi-posts are a very cost-effective option to improve the cycling environment, but they may not be a sufficient level of cycleway separation in every case. 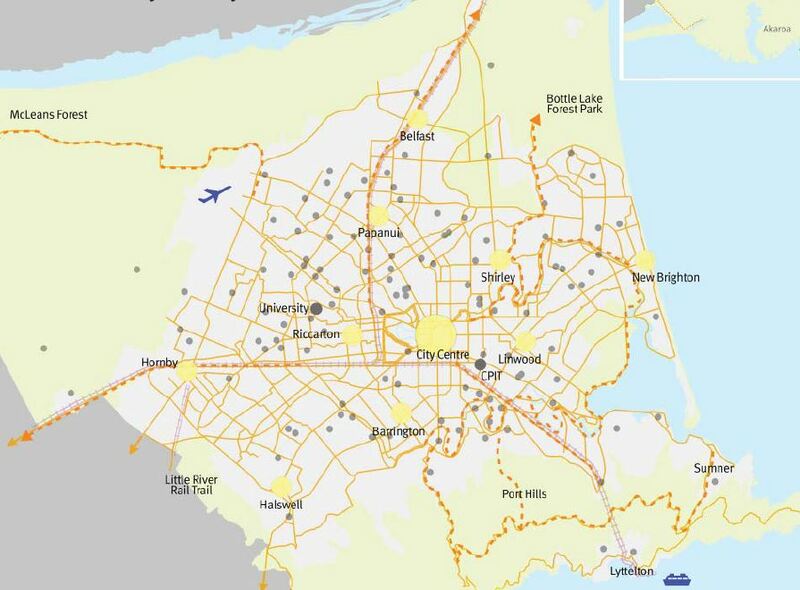 Routes that form part of the planned cycling network in the Chch Transport Strategic Plan. Ideally not sites that will be reconstructed again soon (e.g. SCIRT works), although they could be an interim pre-cursor to a later Major Cycleway Route. If you have some ideas for where these separators could go, post a comment on this page (“me too” comments supporting previous suggestions would also be helpful). We’ll make sure that the City Council has a look at the collated suggestions. Milton/Strickland intersection – another potential site? Where else would you like to see some cycle lane separators? I note that separate cycle lanes are shown on the ChCh Transport Strategic Plan for the Spine road from Buchanans Rd to Yaldhurst Rd through the new Living G Yaldhurst zone. This is also required by the City Plan including for the loop road with the requirement for these roads to also be strategic bus and commercial traffic routes. I would like to see the Council ensure the remedying of these roads as they have erroneously and dangerously completely eliminated the cycle lanes through the busiest section of the spine and loop roads. Dead-ending of the existing cycle lanes causes deadly pinch points that no separator post can remedy. Me too for Kahu Road bridge @ Deans Bush. Another about 50m travelling west on Kahu Road as bridge is the first pinch & the following left bend the second. I would support some at Kahu Rd bridge. This is a popular route for uni and also Girls/Boys High students. I would like to see separators for the cycle lanes at the roundabout on the Ferry, Dyers and Tunnel Road. I am forever being squeezed by traffic drifting into the cycle lane and this route is used by a lot of cyclists. – Barrington St to Whiteleigh Ave – join the cycle lanes. I can’t believe that with all the millions they spent on the motorway overbridge that they couldn’t include bike lanes. In fact, put them wherever you can and paint the lanes red or green, it deters drivers from driving in them immensely if no separator posts or riley kerb exists. Keep up the good work, lets encourage more cyclists on the road as the more separate cycle lanes there are the more we are seen by motorists and the safer we all are. Please have a look at the following location – going from Bealey Ave to Harper Ave. Along the bend in Pages Road the traffic always cuts the corner opposite Cuffs Road. This is the main route into town from Brighton/Southshore – seems to have been missed in the ‘Major Cycleways’ routes. Ilam/Middleton/Riccarton intersection north/south departures? Definitely this is one on my wish list for the last two years to improve the road crossing safety. Besides cycle lane, would the Council consider a re-alignment of this intersection please? I.e. a proper + intersection , rather than current off-set layout please. One of the problems with the Left turn separators is vehicles turning left starting their manoeuvre and cyclists riding “under” them. This is especially a problem with cyclists approaching “at speed”. Examples such as that suggested by Zane, above, at the Dyers Pass Road roundabout would likely cause more accidents as cyclists would be encouraged to ride “under” the traffic waiting at the roundabout rather than wait in the queue. The problem with encouraging cyclists to ride under a queue of traffic at a roundabout such as that at Dyers Pass Road is that you then have two “competing” vehicles (car and bike) waiting at the intersection. Combine that with a left turning car and a bike that wants to go straight or right and you have a very dangerous situation, especially if the car driver was there first and therefore “feels” they have right of way. A very good idea, but I think we should be identifying “vehicle” commuter routes and “cycle” commuter routes. Roads identified as cycle commuter routes should be narrowed, vehicle speeds calmed, and cycle lanes widened and protected. Roads identified as vehicle commuter routes should have cycle lanes removed altogether and cycling generally discouraged. By haphazardly shot-gunning tools such as these throughout the city we would do nothing to create truly safe cycle corridors from one place to another. Blenheim Road, left turning into Annex, or is this an NZTA road? Me too. Always getting cut off by left turning traffic at this intersection. On the inside of the turn where Blighs Road turns into Idris Road – this is a marked cycleway right beside Waimairi School on a route frequently used by large trucks. Cycle lanes on Bealey Ave would be wonderful. Please! Take 200mm from each of the travel lanes & 900mm from that beautiful grassy median (do save the daffodil bulbs and take care not to damage the tree roots). Or why not do away with the parking lanes? Always terrified of someone opening a door or pulling out without looking. Me too on this one . All three roundabouts in this area ( Rutland/St Albans St’s ) , ( St Albans, Trafalgar and Courtenay Streets ) and (Roosevelt Ave , Westminster St and Courtenay Streets ) are difficult as commuting traffic frequently expects to share the roundabout with someone on a bike . There is not room for that to be done safely . Another pinch point in this area which needs work is the T intersection where Westminster St meets Rutland Street. Enforce a minimum road width at “pedestrian refuges” and road dividers (a.k.a. cyclist killers) and remove them or widen them if they are too narrow, e.g. the one outside South City on Colombo St going north. I had a close call with a bus there, and now always look behind me to check for buses before going through squeeze points like this – it doesn’t seem that the bus drivers are particularly careful around cyclists, given the run-ins that both my wife and I have had with them. Given how much we share lanes with buses, surely an “if in doubt don’t try to pass” message can’t be that hard to emphasise. Separators for the cycle lanes at the roundabout on the Ferry, Dyers and Tunnel Road would be awesome. I use Ferry Road every morning and the squeeze is always on. always by people going straight. The ones turning into Tunnel Road seem to be able to do it properly! Some bus drivers are pigs. I was deliberately run off the road by a bus – he told me it was “because I was trying to outrun the bus” I did not even know he was behind me, but even if I had that is no reason to run a bike off the road. To be constructive – It seems the buses harass cycles in bus lanes and it would be very helpful to paint cycle symbols in the bus lanes to remind the idiots that they share the bus lanes. I agree there do seem to be a disproportionate ratio of poor bus drivers hence my quick win comment above. Although I also recognise some bus drivers are very good. Perhaps the buses bulk compared to cars just makes their misdemeanours seem much worse ? There always a mix of good & bad drivers (no indicators, red lights, lanes, not looking) , cyclists (no signs, red lights, footpaths, no helmets), walkers (jaywalk, not looking) , etc. There are several bends on Kahu Rd (and where it becomes Kotare St), near Christchurch Boys High School. I see motorists driving in the cycle lanes on these corners every single day. The visibility around the corner is not good, you cannot see if there is a cyclist just ahead and I’m totally expecting to see an accident there one day. Also where the road goes over the small bridge it is very narrow and needs more separation for the cycle lane. There are a lot of cyclists around there as it’s close to not just the high school but the uni too. I have been cut off by cars many times on those turns. I’d also strongly recommend putting some separators on the small bridge as many cyclists use this route and some oblivious drivers can encroach dangerously at this point. This would be an great choice for further separators. I agree, but if a motor vehicle is waiting to turn right from Kotare into Kahu, the traffic approaching from behind is allowed to use the cycle lane to pass the turning MV on the inside. It is unlikely that Separator Posts will be installed at this intersection. Bridge by Deans Bush, yes. Also left hand bend in Kahu, opp Boys High, 90% of MV go into this bike lane. Vehicles travelling south/east on Kotare and turning right into residential part of Kahu are in minority compared to those following the natural route left onto Kahu towards central city. <10% turn right ? That’s minor enough traffic volume that I don’t think it would prevent posts being installed. Occassionaly the right turners will cause a few cars to queue but not a common event. I’d rather opt for safety in cycle lane over minor ocassional vehicle inconvenience. There are so many people rushing from queue to queue. Surely separators are most needed where MV’s are most likely to cross into a cycle lane. This makes Kotare/Kahu a particularly good and necessary place for the separator posts. 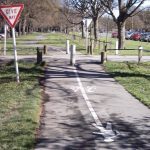 Also – I know it’s tempting for cyclists, especially fast moving ones, to ride on the road through Hagley Park (I often see this on Harper Ave). However there’s not much room at all, especially at either end of that stretch of road. Given that there are excellent cycle lanes right there, I think that is one short stretch where it should be compulsory to use the cycle lane, maybe an “all cyclists” sign or something. Completely agree with you. I try and be courteous but sometimes I can’t help but feel frustrated by the bands of walkers who take up the whole path. I’d love it if this was enlarged or divided further to make it more obvious that ‘sharing’ is needed. ” excellent cycle lanes ” , do you mean the paths within the park that are shared by pedestrians also ?. I always use them but it can be a slow trip of politeness, smiles and bell ringing . And you really get the feeling that you are encroaching on someone else’s space , big time . Not too worried where a dedicated path for cycles should be put ( or a very large shared pathway with pedestrians ) either in the park , or separated from vehicles on the road , but it would be great to see some improvement made here . “Antigua St / Moorhouse Ave intersection north/south approaches” – yes I second that. I support these. The northbound on Antigua/Brougham one has been a great improvement. I really would like to see the Greers/Northcote/Saywers Arms intersection east approach. I have cycled here almost daily and the vast majority of cars encroach on the cycle lane. I also would like to see these things policed better. 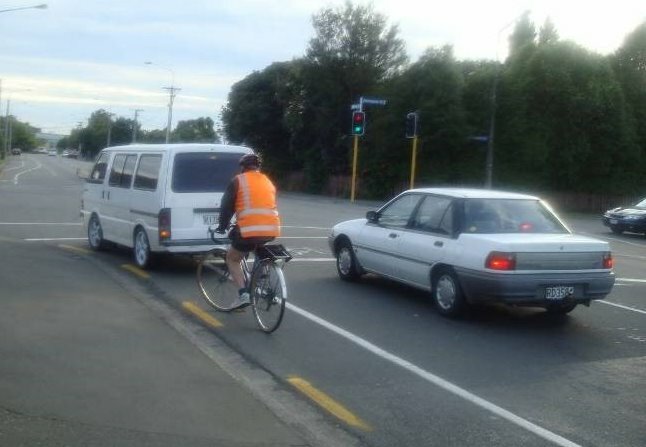 There is a blatant disrespect of cycle lanes in Christchurch, and people use them not only as shortcuts but also as a overtaking lane, temporary parking, maximise your parking space ect ect. It is time to give it back to cyclists!! The approach to the Sockburn roundabout down Main South Road. Ferry Road / Moorhouse Ave Intersection, heading into town on Ferry road, cars tend to cut the corner by the car sales yard, a few separator posts would be brilliant on this high cycle traffic intersection. The inside of the bend in Kerrs Road as it turns into Wainoni Road would benefit from having separators. Lots of drivers cut this corner. New Brighton Road , heading East , Bampton Street is on the right and Windsor Rest Home on the left. This tight curve, although well marked is often encroached by traffic. On the corner of SE corner of Latimer Square (directly in front of the Cardboard Cathedral). There is a marked cycle lane in Madras Street/Hereford St intersection (to the immediate west of the Cardboard Cathedral) which disappears as you peddle northwards around the SE corner of the square. I think the cycle lane marking should be extended from Madras Street/Hereford Street northward and along the entire eastern side of Latimer Square (move the cars and traffic lanes over!). Another good suggestion. Perhaps we just need good cycle infrastructure and networks through out the city? As a driver as well, it’s also important to place the separator so that it makes the driver aware of the cycle lane and prevents them stopping in it while waiting to turn, but not so far forward that it makes the turn unnecessarily tight for the car. The original separators turning left from Strickland Street into Brougham went right up to the line, but then made the turn uncomfortably tight for the cars. I notice that the last separator has since gone, or was moved or broken, and the corner is more natural for a car, while still achieving the purpose of keeping cars out of the bike lane. If we want buy-in from drivers, we need to be careful to make them work as well as possible from their point of view too and not unnecessarily annoy people. Great comment. Adding cycle safety systems that annoy drivers might make other places more dangerous. I think these seperators are dangerous at the Strickland St intersections. At least before we knew when people were turning left if they were blocking the cycle path. Now they don’t indicate, don’t look and wipe cyclists out. I’ve been knocked off my bike once and nearly knocked off another time when I was approaching the red light which turned green just before I got to the front where the driver would have seen me. These days I merge into the traffic lane before reaching those poles. Talking to other cyclists at those intersections many agree with me. The answer is to have a proper left turn lane which needs to cross the cycle path, and the cyclepath ends up on the right of the turn lane. I can see how that could be an issue, but I hate it when the bike lane has to cross the path of the left turning traffic – it happens too many times on Colombo Street. A better solution would be to have a bike signal change a second or two before the cars’ signal (although more expensive than a couple of separator posts). Yes agree the best solution would be a bike signal change. I know it’s annoying that people sit their cars in the bike lane but I think it’s safer than being wiped out unexpectedly. Also it doesn’t help that there are still left turn only lanes on Antigua, and many straight ahead cars get stuck behind the right turners, which causes frustration and no longer necessary since the give way rule changed. What about a shared turn left/bike lane…..everyone just sits one behind the other, there’s actually not that many left turners on that intersection and it will stop last minute left turners as they will be in the wrong lane…just an idea…. A good start would be every inside curve on Kilmarnock / Kahu / Kotare / Creyke Rds, from the Hagley Park to Waimairi Rd, and every inside curve on Cashmere / Centaurus Rd, from Hoon Hay Rd to Opawa Rd. Both are well-used by cyclists, and on both most motorists have difficulty staying out of the cycle lane. 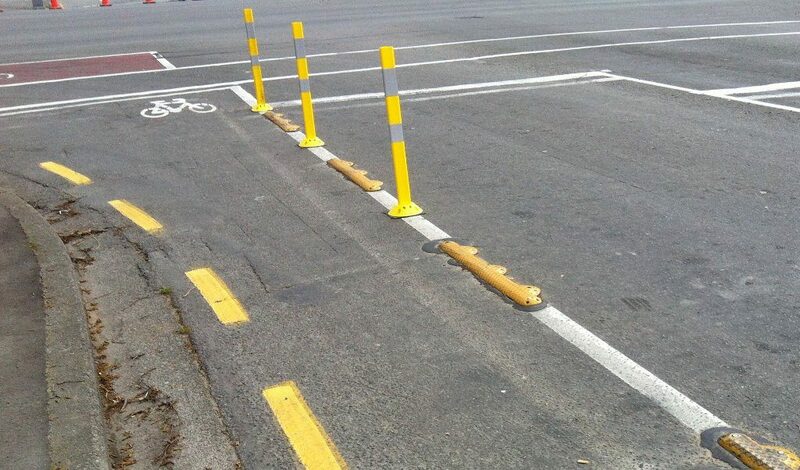 The posts are better than the little yellow bumps – to be effective at stopping vehicles entering the cycle lane, barriers need to be designed so that they will obviously cause vehicle damage should they be hit. Anything less and they will simply be ignored. Hmmm, a late post, but I cycle through Strickland / Brougham most days and I agree with Nic and others in that the separator posts reduce my perception of safety. The dynamic of moderately slow queues of vehicles discharging to turn left on green together with a stream of cyclists on their inside moving at a similar speed provides the conflict issue that the posts are supposed to assist with. But instead of cyclists and motorists proceeding with caution at this point of conflict, my feeling is that both now proceed with a feeling of right-of-way given the dedicated roadspace enforced by the separators. After a couple of close shaves, when going straight-on, I now adopt the right-most side of the vehicle lane on approach to the intersection to avoid the conflict point. I would rather see a dedicated left-turn lane inside a coloured cycle lane at this location and really feel these posts have a detrimental impact on safety. I know this is a bit late, but I’ve lately noticed a few left-turning cars cutting across the cycle lane at the Southern Motorway’s westbound offramp onto Barrington St. I’m a fan of separator posts and reckon they would help here. I see that Kahu Road cycle lane at the Straven Road intersection has been painted the nice bright green with a few separator posts while the road has been closed for bridge repairs. I got feed up seeing cars use the cycle lane as their own left turning lane. Loving the new bright green paint that has now started appearing in cycle lanes around the city. Hope this is the new standard rather than having a combination of red or darker green. I’m impressed with it too. Low cost & hopefully its effective. I’m wondering when the bridge repairs will be finished? They blocked whole road for weeks to do one side but when work started on the second side, fences & road cones put out, road opened & since then very very little progress. It’s back to a narrow jumped bridge on a bend, no footpath on one side & road coned area for pedestrians. Essentially I’m forced back into ‘taking’ the lane to ensure my safety. Yaldhurst roundabout. Commuters into town use the cyclelane to get one or two cars ahead in the morning queue. I think this roundabout is poorly designed for cyclists anyway. I am aware there is quite a bit motor traffic that the roundabout needs to process but as a cyclist I want to be on the roundabout rather than do a sidewalk detour before crossing the roundabout again whenever there is a small gap. Four years later and these posts are mostly gone from the roads. Realise they’re gone because some motor vehicle hit them. How about restoring the posts ?